I'm so sorry Trayvon. And to the Martin family. 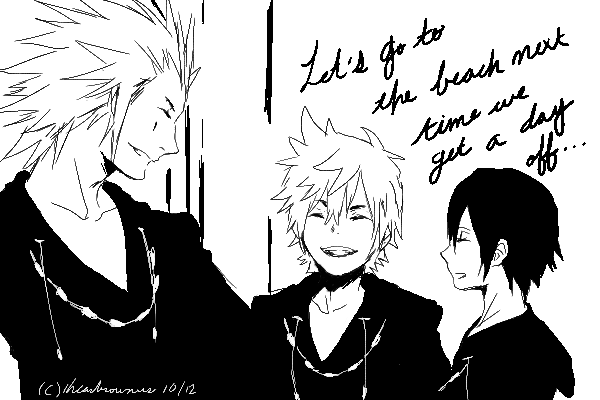 Let's go to the beach next time. Super quick sketch from the Kingdom Hearts 1.5 trailer! Ah! Final Fantasy XIII-2 is coming out tomorrow! ; ______ ; But I don’t think I can justify of paying $60 for a game right now. Plus, I want to get the limited edition. Hopefully the price will go down or find it somewhere like on Livejournal or something. Today was my final class for English. Our final assignment for English was to write a five page literary analysis on some of the short stories we went over which includes Hemmingway and Scott Fitzgerald. I did mine on "The Ones Who Walk Away From Omelas" by Ursula K. Le Guin. Basically I wrote about how there is no such thing as a utopia. It doesn't exist. My professor really liked it and gave me an exception to write only four pages because it was so deep and I made all the points that I can make! That was the highlight of my day! > v < Hope everybody is doing well and hope to hear from you guys soon! Does anybody ever have one of those days when you can draw really well one day, then the next day you can’t draw squat?! Or anything similar in that matter? IT’S ONE OF THOSE DAYS. More like everyday for me. . ____ .